Mozambique’s first all-female crew | Photo used with permission from Meck Antonio. It is a historic day: that is how many Mozambicans regard December 14, 2018 when, for the first time in the country’s civil aviation history, an airplane was operated solely by women. The crew for flight TM112/3, which traveled between the capital, Maputo, and Manica — an air distance of 442 miles — was captain Admira António, co-pilot Elsa Balate, cabin chief Maria da Luz Aurélio, and flight attendant Débora Madeleine. The women are members of MEX, an entity originally created as the Special Operations Department of LAM — Linhas Aéreas de Moçambique. In 1995, it began operations as an independent airline, Mozambique Express. Por mais mulheres em todos os sectores. For more women in all sectors. Na aviação há muito poucas mulheres, poucas mesmo, isto não é aqui apenas mas em todo mundo. Imagino as mulheres por aí a fora que julgavam ser esta profissão apenas para homens, devem sentir se orgulhosas. In aviation there are few women, very few, this is not only here but in the whole world. I imagine the women who thought this profession was for men only, should feel proud. Mozambique is not alone. 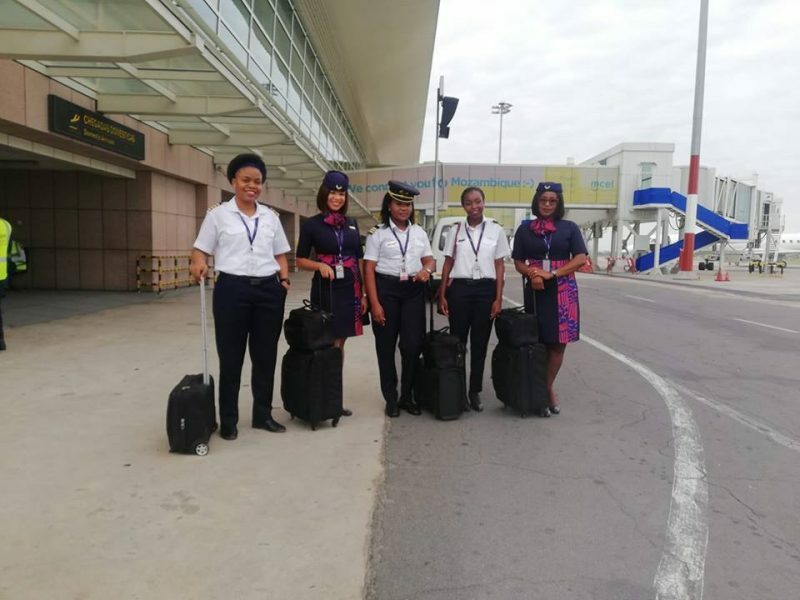 In August 2018, in a first for South Africa’s national carrier SAA, an intercontinental flight with an all-female crew took to the skies to transport passengers from Johannesburg to Sao Paulo, Brazil. Eight months earlier, in December 2017, Ethiopian Airlines operated its first ever flight staffed by an all-female crew. From pilots to cabin crew, check-in staff to flight dispatchers, the flight — from Addis Ababa in Ethiopia to Lagos in Nigeria — was (wo)manned entirely by women.